This is the 19th year that McGregor has been commissioned to paint original artwork for the annual SFF poster that attracts thousands of people to the three-day event. 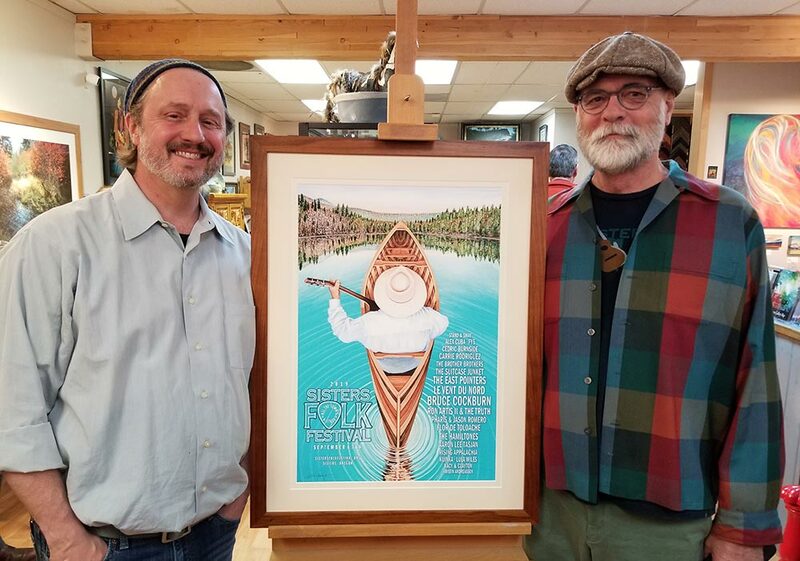 Around 6 p.m. the poster was revealed, and folks couldn’t have been more thrilled when they gazed upon “Ripples,” artwork depicting a man in a canoe holding a guitar in a bright blue lake as ripples expand across the water. McGregor set the tone for the 2019 festival with the poster by capturing the spirit of the event and the role of SFF in the community. The 2019 SFF poster wasn’t the only thing revealed Tuesday night at Sisters Gallery & Frame Shop: Twenty of the 2019 confirmed musical lineup were printed on the poster for folks to check out. “Artistically we want to be as broad ranging of excellent talent and I see a sense of discovery in that we don’t have to book the biggest bands but some of the best in songwriters and artists,” said SFF Creative Director Brad Tisdel. “It’s a really brilliant broad swath of Americana and acoustic music. As we grow and develop, we want to have things right down to the center of the plate, but we also want to push the fringe and the edges a little bit with music that you’ve never seen. Adding to that is Ron Artis II & the Truth, Le Vent Du Nord, Cedric Burnside, The Hamiltones and more. SFF will book another 20 to 25 acts, and the final lineup will be released by mid-June.